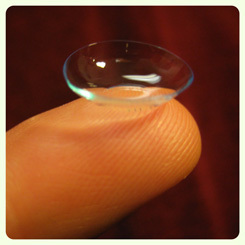 We provide contact lens exams in the Santa Rosa Costco. Bradley I. Hall, OD, PC is an independent optometry office inside the Santa Rosa Costco that provides thorough eye examinations and contact lens fittings. After your eye exam, we discuss with you which contact lens options are best suited for your eye health, visual needs and lifestyle. Many of these contact lens options overlap, and which contact options are most suitable for you depends on your individual eye, vision and lifestyle needs. Since we have a 17 drawer cabinet along with other separate cabinets well stocked with a large variety of contact lens trials we are able to provide patients with diagnostic trial lenses during contact lens exams in the vast majority of cases. Occasionally we need to order trials, especially for patients with more challenging prescriptions. After the contact lens examination and fitting, our patients have the freedom to take their prescription for contact lenses to the optical of their choosing. Most patients choose to take their prescription to the Costco Optical located next to our office. Costco Optical departments provide a good value on eye care materials and received the top rating from Consumer Reports during their most recent review of opticals. Please note that you do not need to be a Costco member to be fit for contacts in our office, but you do need a Costco membership to purchase contact lenses at the Costco Optical. Straight ahead vision often is better with contact lenses than with eyeglasses. Since vision correction is away from your eyes with eyeglasses as opposed to on your eyes with contact lenses, there can be visual aberrations and distortions with eyeglasses compared to vision with contacts. With many eye conditions, such as keratoconus, vision is very likely better with contact lenses than with eyeglasses. How your vision functions is often better with contact lenses. For example, with bifocal/multifocal contact lenses you have vision focused at distance, intermediate and near wherever you look because the lenses are on your eyes. With bifocal/multifocal/progressive eyeglasses you must look through certain parts of the lenses for the distance you want to view. If you need further information or would like to schedule an eye exam and contact lens fitting, please call our office at (707) 570-2418.